Wolves excitedly greet each other as members of the pack come together; a bumble bee uses its long tongue to reach the nectar at the base of a foxglove flower; a mongoose swiftly and deftly bites its prey to death; young cheetahs rest quietly together, very close to sleep. Now in full colour, this revised and updated edition of Manning and Dawkins' classic text provides a beautifully written introduction to the fundamentals of animal behaviour. Tinbergen's four questions of causation, evolution, development and function form the fundamental framework of the text, illustrated with fascinating examples of complex behavioural mechanisms. The authors provide accounts of all levels of behaviour from the nerve cell to that of the population. 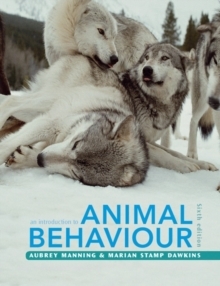 The strengths of An Introduction to Animal Behaviour as a textbook include its clear explanations and concise, readable text and the enthusiasm of the authors for their subject.